Nestled in the heart of whitewater rafting country, Hawks Nest State Park is a 270-acre recreational area with a nature museum, aerial tramway, jetboat rides, hiking trails and one of the most challenging whitewater boating waterways in the nation. Its 31-room lodge offers luxurious rooms, dining and spacious conference and meeting facilities. Located near Ansted in Fayette County, about 10 miles north of the New River Gorge Bridge, Hawks Nest is known for its scenic overlook, which provides a bird’s eye view of the rugged New River Gorge National River below. Take some time out of the day for a relaxing boat ride on the Hawks Nest Lake. Proper license is required before you hit the water! See what you can catch at Hawks Nest Lake with a day spent on the water. Proper license and stamps are required and are available for purchase at www.wvfish.com. Maintain your game even during vacation! The New River Gorge region has plenty of golf courses. There’s even putt putt, if you’re so inclined. Be your own pioneer and take a beautiful hike through eight miles of trails at Hawks Nest to get a closer look at the beauty of the surrounding mountains. Each trail varies in difficulty, so stop by the park office beforehand to pick up a map and choose your journey! Carnifex Ferry Battlefield State Park in Summersville is a Civil War site with a museum, trails, and off-year reenactments. While rafting is sure to keep you busy, there are many other things to do in and around the park. 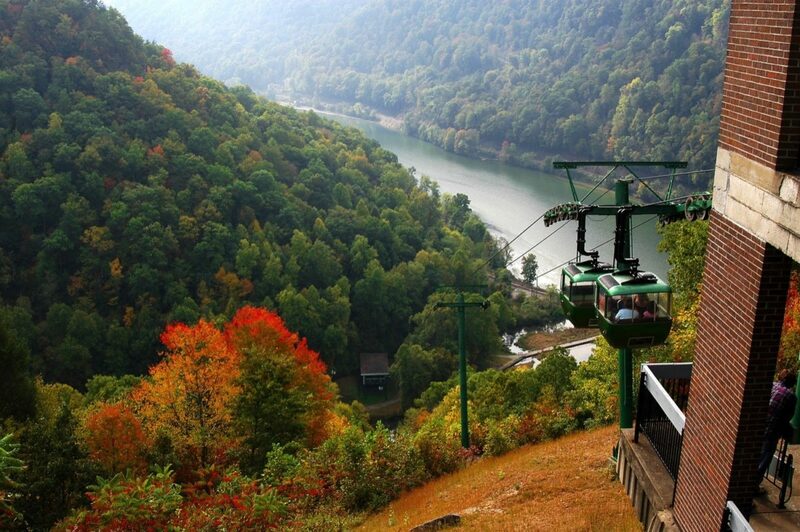 Ride Hawks Nest State Park’s aerial tramway from the top of the scenic New River Gorge canyon to the marina at the bottom. Hours of operations are 11 a.m. to 4:45 p.m. Monday through Friday, between Memorial Day and Labor Day. The tram is closed on Wednesday for routine maintenance. In May and September, the tram is open on Saturday and Sunday from 11 a.m. to 6:45 p.m. It’s also open in October on weekdays (except Wednesday). The last day of the 2018 season is Sunday, October 28. From the marina, ride a jet boat to see the famous New River Gorge Bridge from the river below. Bicycle rentals are also available in the neighboring town of Fayetteville. Hawks Nest State Park is in the heart of West Virginia’s whitewater rafting country, making it the perfect time to try something new and thrilling. Rafting on the New River is one of the most popular activities in Hawks Nest, with several whitewater rafting companies located within 10 minutes of the lodge. Enjoy the New River, or for the more adventurous, the wild waves of the Gauley! Brochures are available at the lodge’s front desk. Get your feet wet at Hawks Nest pool! Seasonal swimming, Memorial Day through Labor Day, is an amenity at Hawks Nest Lodge for overnight guests. Pool access is via a keyed entry system. 859 attraction is located outside of the park. West Virginia is home to some of the most beautiful and remote areas in the United States. Be sure to download your Park Pack for maps and other park information. Long before Hawks Nest became a state park, the area was a nesting ground for numerous osprey and the site of a trail used by Native Americans. In the late 1800s, the portion of the Chesapeake and Ohio Railway running through the gorge was completed, and scattered most of the birds inhabiting Hawks Nest’s cliffs. In 1934, the Hawks Nest Dam and lake were completed. At the time, they were used to generate hydroelectricity for the growing manufacturing industry and for flood control. In 1935, the state of West Virginia purchased much of the property that is now Hawks Nest. In 1963, the Department of Natural Resources took control of the property and built the park lodge and other facilities that now draw visitors from nearly every state, to enjoy the scenic views of the New River Gorge. Hawks Nest Lodge’s 31 rooms offer stunning panoramic views of the New River Gorge, with some offering intimate, private balconies. The lodge also provides WiFi, a seasonal outdoor pool, gift shop, and an on-site restaurant with spectacular views of the gorge below. Get a change of scenery at Hawks Nest and book a spacious conference center or meeting facility. Your guests and group will never tire of the park’s views! Enjoy a meal as you take in the breathtaking views of the New River Gorge. The Vista Restaurant at Hawks Nest Lodge includes an express breakfast with overnight room reservations. Sunday Brunch begins at noon and features entrees as well as breakfast foods. Catering options for all meals are available for your next business meeting, family celebration or special event. The trail starts behind the Midland Trail Shelter near the lodge and ends near the Hawks Nest Overlook at Route 60. Sections are rugged and adjacent to steep drop-offs. This is an excellent trail for viewing the geology of the New River Gorge, high Nutall sandstone cliffs and the waterfall of Turkey Creek. Hikers also will see the Hawks Nest Dam and Tunnel areas. To return to the lodge, cross Route 60 at the lower park, take the steps behind the gift shop to the old museum, walk the service road to the end, then cross Route 60 to the lodge. Use caution when crossing the highway and near all steep embankments. Children must be accompanied by an adult and pets must be leashed. The trail begins at the far end of the lake parking lot toward the Hawks Nest Dam and follows the lake, providing an excellent view of the dam. It ends at the Turkey Creek waterfall. The short, paved path starts at the parking area a quarter-mile downhill from the lodge and takes you to the overlook for a panoramic view of the New River, the Hawks Nest Tunnel area and surrounding mountains. The overlook was built from local sandstone in the 1930s by the Civilian Conservation Corps and has been improved to ADA standards. This gravel trail begins behind the nature center, follows Mill Creek and ends near Ansted. Two bridges, waterfalls and the remains of a coal mine that operated through the 1920’s can be seen along this slightly uphill trail that once was a railway for coal cars. There is no trail fee, but a ticket must be purchased when accessing the trail by aerial tram from the nature center. Bicycles are permitted. The trail is maintained by the town of Ansted and volunteers. The trail begins at the tram office behind the lodge and ends at a rock outcropping with steps most of the way. Local legend has it that Lover’s Leap was the scene of a tragic suicide between an Indian brave and a maiden who fell in love but were forbidden to marry. The overlook offers sweeping views of the New River and the marina. The trail circles through a wooded area behind the shelter. Downed trees obscure the center section of the trail. Many wildflowers can be seen in the spring. Have a blast at Adventures on the Gorge! Located three miles from Hawks Nest, Adventures on the Gorge offers nature and wildlife tours, river rafting, tubing, boat tours, water sports, and other exciting outdoor activities. Babcock State Park is the perfect getaway with its famous Glade Creek Grist Mill just 21 miles southeast of Hawks Nest State Park on U.S. Route 60. It has a lake for fishing and boating, hiking trails, campgrounds, cabins, and trails for hiking and biking. Located four miles southeast from Hawks Nest on U.S. Route 60, this National Parks Service facility offers visitors information on the history and attractions of the New River Gorge, along with scheduled nature activities throughout the year. Are you ready for a challenge? The Endless Wall Trail is a 2.4-mile moderate walk that passes through rich forest, crosses Fern Creek, then zig-zags along the cliff edge. Many vistas can be seen along the trail. Find the trailhead four miles from Hawks Nest State Park, southeast on U.S. Route 60. Be the first to enjoy the first established rock climbing guide service in the New River Gorge, specializing in rock climbing and rappelling for nearly 30 years. Each trip is catered to the client’s needs, and available for both individuals and groups. The climbing is based in Fayetteville, 12 miles from Hawks Nest State Park on U.S. Route 60 and WV Route 16 south. Blaze a new trail and make a furry friend in the process! Two nearby stables offer horseback riding excursions through scenic backwoods trails. Horseshoe Creek Riding Stable, based in Hico, is just 8 miles from Hawks Nest State Park east on U.S. Route 60; and Equestrian Adventures in Fayetteville, is 16 miles from the park on U.S. Route 60 and WV Route 16 south. Midland Trail National Scenic Byway is the road of choice for those who prefer the scenic route. Route 60 winds 180-miles across West Virginia’s midsection, offering a drive filled with fabulous vistas, world-class rafting, outdoor fun, art and artisan treasures pioneer history. It passes right by Hawks Nest State Park and has many roadside attractions you can’t miss! This popular roadside attraction is two miles east of Hawks Nest on U.S. Route 60. Here, the laws of gravity seem to have gone berserk and your sense of balance is entirely upset. Come see what the mystery’s all about for yourself! At a height of nearly 900 feet, the New River Gorge Bridge is the second highest bridge east of the Mississippi. Foot traffic is only allowed on the bridge on the third Saturday in October for Bridge Day. On that day, the bridge is open to pedestrians, food and craft vendors, musicians and more. During the rest of the year, guests can take a Bridge Walk, touring the underside of the bridge via catwalk 850 feet above the New River. Bridge Walk tours are scheduled daily and tickets and reservations are required. Plunge into the clearest water east of the Mississippi. Known as the “Little Bahamas of the East,” this exotic lake is a popular spot for boating, swimming, scuba diving, and stand-up paddle boarding. It’s also West Virginia’s largest lake, with 60 miles of shoreline. During the first two decades of the 1900s, Thurmond was a classic boomtown. With the huge amounts of coal brought in from area mines, it had the largest revenue on the Chesapeake & Ohio Railway. Today, with a population of less than 10, the town of Thurmond remains surprisingly untouched by modern development. It is a link to the past, and a town with many stories to tell, including the impact of America’s industrial revolution. Find Thurmond 25 miles south of Hawks Nest State Park on U.S. Route 19. Book your world-class zip line canopy tour through the old-growth hemlock forests of the New River Gorge. This unique combination of zip lines, cable sky bridges, and stationary tree platforms are an adrenaline-charged way to view the local flora and fauna from areas that are otherwise inaccessible. Just four miles from Hawks Nest State Park southeast on U.S. Route 50.